Two burglars who stole thousands of pounds worth of computer and mobile phone equipment from a Northamptonshire shop have been jailed for two years. Kane Morbey and Adrian Snape, both aged 31, carried out a raid of Everything Apple Ltd in Weedon in the early hours of the morning. Northampton Crown Court heard the pair stole dozens of iPhones, cases and laptops from the store on September 12 last year. Jenna Allen, prosecuting, said the owner of the store chased Morbey after he was alerted by the store alarm and drove down to investigate. Mrs Allen said: “The owner arrived at the store to find the window was smashed and saw a man running away with a bag. “The man then got into a car that was parked up. Mrs Allen said the car accelerated up the A5 towards Hinckley but the owner managed to get the car’s details and passed them on to police. Morbey and Snape were arrested a couple of hours later and a number of stolen items, including 1,500 iPhone cases, were found in their vehicle. The owner estimated that he had suffered a loss of £4,500 including the repair needed to his shop window. Snape and Morbey both pleaded guilty to burglary. 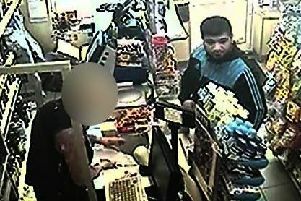 Morbey was also found to have committed a burglary of a shop in Wolverhampton in July. The court heard three men carried out an untidy search of the shop before running off towards a BMW. The men were confronted by a police officer and Morbey then threatened him with a crow bar. Judge Michael Fowler described Morbey, of Birmingham, as a “professional burglar” and sentenced him to two-and-a-half years in jail. He sentenced Snape, of Camelot Way, Birmingham, to two years in jail.